In my previous blog I mentioned that you will be able to protect stand-alone servers using DPM 2010. According to the DPM product team "This feature is not yet available in the public beta release, but is intended by the release candidate in early calendar 2010". 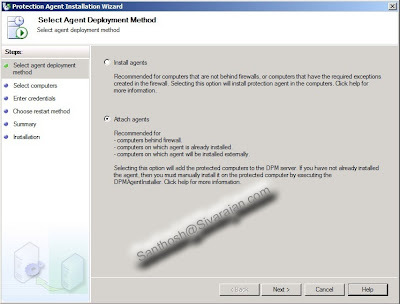 If you look at the agent installation wizard in DPM 2010, you will see a new option called "Attach Agent". We didn't have this option in the previous version of the DPM products. In DPM 2010 you can attach an agent without using power shell.